If the most engaging and satisfying documentaries about musical acts tend to come from filmmakers who are smart, passionate fans, that rule perhaps applies doubly when the subject is obscure rather than world-famous. 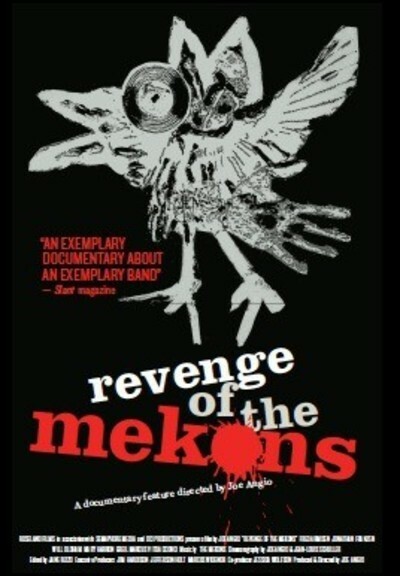 So it is with “Revenge of the Mekons,” a portrait of a long-lived English punk group that is the very definition of a cult band: Director Joe Angio not only gives us a sharply crafted account of this quirkily protean outfit, he also conveys his feeling they’re as great as any band you care to name. Nor is he alone in that. One very notable thing about the Mekons is that, while they’re said not to sell more than 8000 copies per album and they play in clubs rather than concert halls, they have staunch fans that include such notables as critic Griel Marcus, filmmaker Mary Harron, and authors Jonathan Franzen and Luc Sante–all of whom speak to Angio’s camera as true believers. What they marvel at is not only the band’s musical fecundity and infectious live shows, but also its spirited endurance over more than three decades, despite recurrent personnel changes and a persistent lack of fame and fortune. In a sense, the Mekons are a great bar band of a sort that will be familiar to aficionados of any music scene that values originality and exuberance. Their difference is they’ve managed to make the world their stage, touring internationally and making record after record though ultimately never earning enough to quit their day jobs. The producer replied he didn’t want a proper band; he wanted the Mekons’ noise, in which he detected an embryonic pop sense. Once their recorded work was played by legendary BBC deejay John Peel, the band had a national following, and it was only a short step from there to a deal with Virgin Records. But the Mekons and big-time record companies didn’t mix. As happened a decade later with A&M Records in America, the band was perhaps too insistent on its own autonomy and control, while the label had no interest in continuing to fund a group that didn’t crank out instant hits. Unlike in the U.S., much British punk was bound up with the left-wing politics of the era, and the Mekons were no exception. While they were fervent supporters of Rock Against Racism, the 1984 miners strike, and many another anti-Margaret Thatcher causes, at one point they quit playing because the mix of music and political agitation resulted in violence. Retreating from public performance, though, had a happy outcome. While the early Mekons took pride in their musical crudeness, later stages of the band–as some members left and other, more proficient ones arrived–not only cultivated greater musical sophistication, but also overcame the inherent formal limits of punk by exploring and borrowing from other musical forms. First, under the influence of ethnomusicologist-producer John Gill, they discovered English folk. Later, thanks to a mix tape sent them by a Chicago deejay, they embraced the tradition of American country and western. In each of these cases, their admirers attest, the Mekons didn’t simply imitate their influences; they twisted and reinvented them, creating something new and distinctly their own. They also invariably reflected on the political underpinnings of music like folk and country, which so often emerged from the struggles of working-class people. On stage, the band, which currently has eight members, is non-stop energy and frequent hilarity. While they profess a socialist sense of egalitarianism in their way of creating music, their most outstanding personalities, in more conventional show-biz terms, are singers Jon Langford and Sally Timms, who both project an irrepressible sense of zany fun on top of their musical inventiveness. Yet all of the Mekons come across as interesting people, and some of the film’s most intriguing sections explore their lives outside the band, as well as other artistic endeavors and collaborations that sometimes intersect with their Mekons’ work. Several members are accomplished visual artists. Violinist Susie Honeyman and her husband run a London art gallery. Among other members who have outside musical projects, multi-instrumentalist Lu Edmonds lives in Siberia and records and archives the folk music of Central Asia. When the Mekons started out, punk bands were often cited for “attitude,” which then meant youthful insolence and defiance. A few decades on, it can be said that they’re still surviving on attitude, but today the word connotes an acceptance of economic limitations and a smiling embrace of their friendships, fans and the pleasures of creating their music. “Revenge of the Mekons” is so successful in conveying this genial stance that it’s likely to makes fans of any viewers who weren’t before.